Bill did his internship in Professor Miles Wilkinson’s lab at the Sanford Consortium for Regenerative Medicine. Under the supervision of Dr. Terra-Dawn Brannon, PhD., Bill investigated the role of a key protein in the Nonsense-Mediated mRNA Decay pathway. Mutations in the UPF3B protein have been shown to cause certain types of X-Linked Intellectual Disability and have been linked to both Autism Spectrum Disorders and ADHD. Bill’s overall goal was to repair known mutations in stem cells derived from an XLID patient (using CRISPR/Cas9) and assess the phenotypic and molecular effects. Bill’s SDSU mentor, Associate Professor Ralph Feuer, PhD, focuses on viral – host interactions, viral persistence and viral pathogenesis. 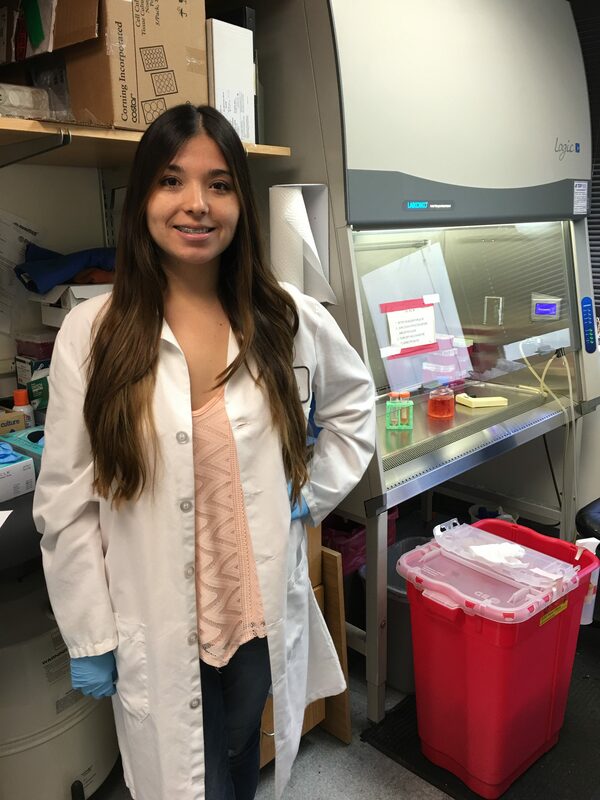 Sarah did her internship under the direction of Abed Mansour, PhD, in the lab of Dr. Fred Gage at the Salk Institute for Biological Studies. Sarah’s SDSU mentor, Associate Professor Ralph Feuer, PhD, focuses on viral – host interactions, viral persistence and viral pathogenesis. Garland did his internship at the Sanford Burnham Prebys Medical Discovery Institute in the lab of Dr. Evan Snyder, under the direction of Dr. Andrew Crain. Garland’s SDSU mentor is Dr. Tom Huxford. Rachael did her internship at the Sanford Consortium for Regenerative Medicine with Dr. Sandra Leibel in the Evan Snyder lab. She studied the development of proximal lung tissues (such as Goblet, Basal, Club and Ciliated Cells) with the intent of improving research on proximal lung cell associated diseases, such as Cystic Fibrosis, in an in vitro model. 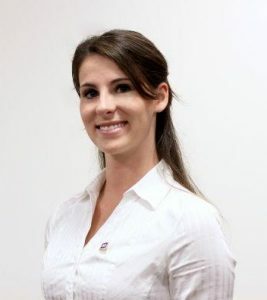 Rachael’s overall goal was to characterize proximal cells by unique cell surface markers in order to increase the efficiency of lung differentiation protocols and enrich the target cell population via Fluorescence Activated Cell Sorting(FACS). Natalie did her internship at Sanford Consortium for Regenerative Medicine in Dr. Larry Goldstein’s lab. Under the supervision of Dr. Paulina Ordonez, she studied the mechanism of two liver metabolic diseases: alpha-1 antitrypsin (AAT) deficiency and nonalcoholic fatty liver disease. 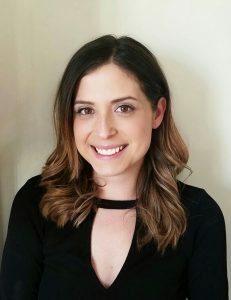 Her goal was to engineer hepatocytes derived from induced pluripotent stem cells to gain enough mechanistic knowledge to identify therapeutic compounds that target early phenotypes of disease. Natalie’s SDSU home mentor was Dr. Natalie Gude, an assistant research professor studying Notch signaling in cardiomyocyte and cardiac progenitor cells. 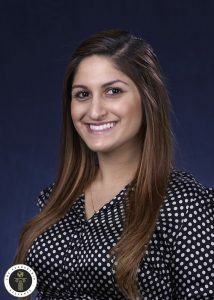 Alicia did her internship in the lab of Dr. Joel Gottesfeld at The Scripps Research Institute, working under the supervision of Dr. Elisabetta Soragni. She studied Myotonic Dystrophy Type I (DM1), a neurodegenerative disorder characterized by a trinucleotide (CTG) repeat expansion in the 3’ UTR of DMPK which can be visualized as RNA foci. The (CTG) expansions often result in the sequestration of an important splicing factor MBNL1 which causes aberrant splicing events and RNA toxicity. Her goal was to derive skeletal muscle cells from iPSCs to model Myotonic Dystrophy Type I, in order to treat the cells with small molecules which act to prevent the expression of the poly(CUG) repeats by blocking the transcription of the expanded genes. 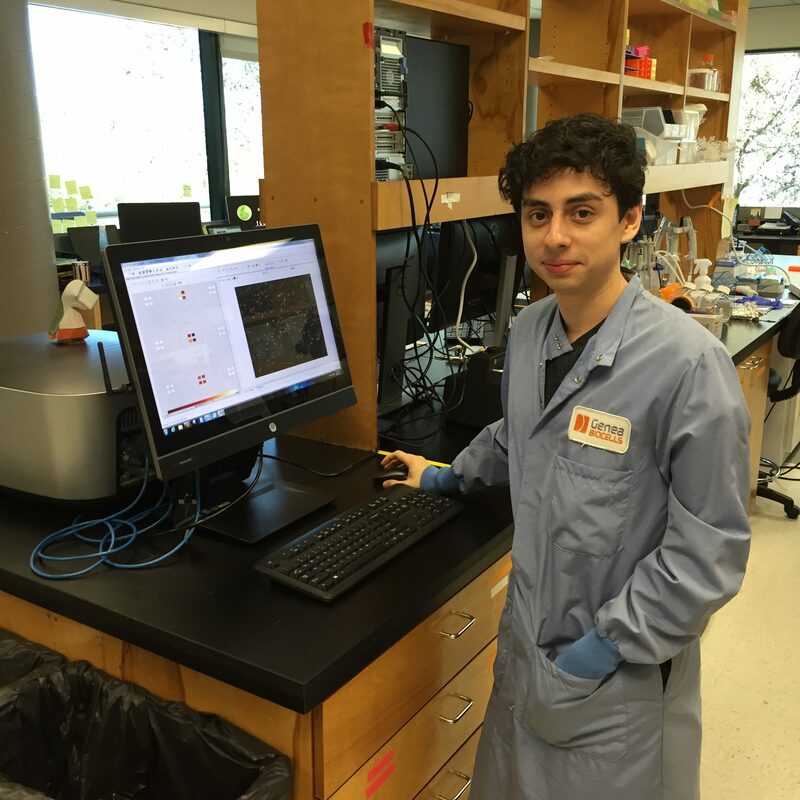 Joe’s internship was performed at Genea Biocells, a biotech company focused on neuromuscular disease research. He was mentored by Heather Main PhD. Their work included characterizing skeletal muscle derived from human pluripotent stem cells to improve upon their differentiation and facilitate characteristics of maturity. The overall goal was to create relevant cellular models for muscle related diseases. 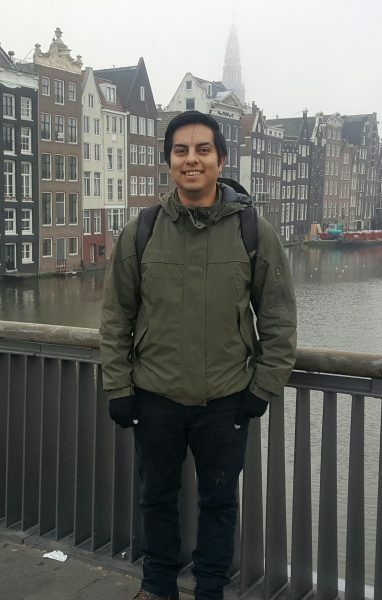 His home mentor was Maureen Gibbins Paolini, the coordinator for the SDSU Bridges to the Baccalaureate Program. Tanisha carried out her internship at the Sanford Consortium of Regenerative Medicine under the leadership of Assistant Professor Karl Willert, PhD. She was developing strategies to target and kill cancer cells expressing the Wnt receptor FZD7. 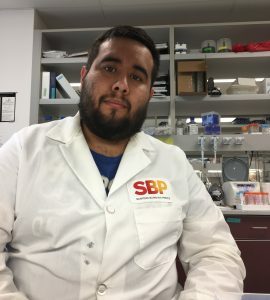 Tanisha’s SDSU mentor, Associate Professor Ralph Feuer, PhD, focuses on viral – host interactions, viral persistence and viral pathogenesis. .
Julio is doing his internship at the Sanford Burnham Prebys Medical Discovery Institute, in the lab of Dr. Pamela Itkin-Ansari. His project is aimed at developing a cryopreservation strategy that would allow for the storage of encapsulated progenitor Beta cells developed from induced-pluripotent stem cells. 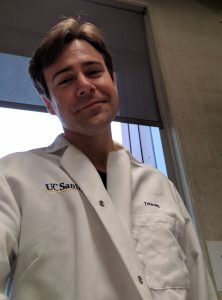 His research is meant to help diabetes patients that require exogenous insulin to survive, by providing a reliable way to store loaded devices with Beta cells that are immuno-protected, but are capable of releasing insulin into the body. Jesus’ internship was performed at Genea Biocells, a biotech company focused on neuromuscular disease research. He was mentored by Amanda Rickard.